Ever since my mother unexpectedly became a widow, it has been hard to really understand what she is going through and experiencing on a daily basis. Any mention of my father brings tears to her eyes. When asked how she is doing, she always says she is alright. I know that my father's death was one of the hardest blows that has ever struck her. And, no one, except for God, can help her and other widowed women like her. Help for my mother came from a seemingly unlikely source. It came from a former New York Jewish/Atheistic woman who also lost her beloved husband. The woman's name is Dr. Ronda Chervin. Some of you may have caught her conversion story on Marcus Grodi's The Journey Home on EWTN. She told a fascinating tale on her unbelief yet search for truth ultimately lead her to the Catholic Church. Dr. Chervin and Anne Lassiter are the hosts of A Widow's Walk on EWTN.com. - Mary, the exalted widow. - quiet prayer of one hour or at least ½ hour unless omitted for good reasons. - simplicity of life as discerned by each member. All Catholics are called to live simply and austerely and to give generously to the needy. Our needs vary, however. One widow needs a house because of family. Another's simplicity of life would call for living in an apartment or room as near as possible to the parish. We give as much as we can to the needy often including the needy in our own families. Dedicated widows dress simply, avoiding luxury and styles that draw attention. We wear in a visible manner a crucifix at least 2 inches in length. - acceptance of magisterial church teaching (including moral teachings of the Church as explained in the Catechism of the Catholic Church). - service in the parish and the wider Church and society as discerned with the Pastor. 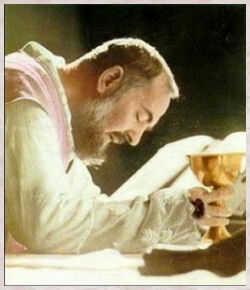 (Many will want to help with Extraordinary Ministry of Holy Communion at Mass or in visitation to the sick and homebound; hospice; Vincent de Paul, food pantries and soup kitchens; social justice work such as pro-life, economic reform, peace-making; faith formation, and other teaching roles; choir and other ministry in the arts, Legion of Mary, charismatic prayer, secular (3 rd Order) groups; and ministry to the grieving such as widow support groups. There is much more useful information about the Dedicated Widows of the Holy Family at the above link. 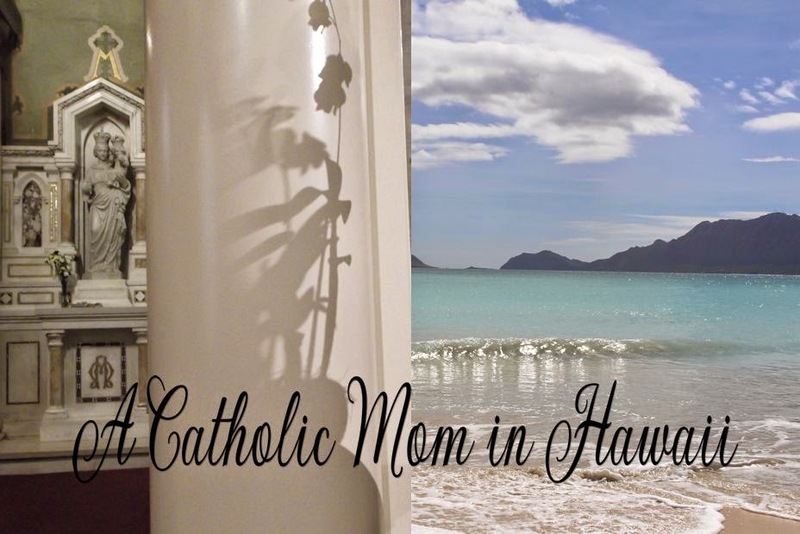 There are also options for Catholic Widows, such as becoming a consecrated widow, here. 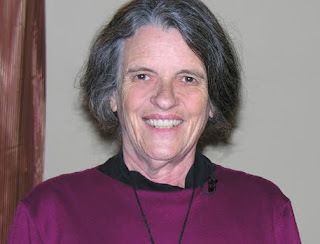 At the present time Dr. Chervin is discerning the call to consecrated widowhood. Thank Dr. Chervin for offering the help to widows such as my mom and other Catholic women like her. Pope Benedict XVI’s upcoming trip to the Czech Republic will include a special visit to the image of the Holy Child Jesus in Prague – one of the most venerated and visited religious images in the country – on September 26, 2009. The Prior of the Carmelite monastery of the Holy Infant of Prague, Father Petr Sleich, spoke last week to international Catholic pastoral charity Aid to the Church in Need (ACN) about the Pope's forthcoming visit to the Czech Republic. 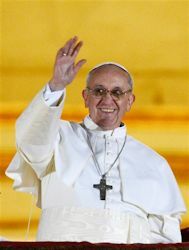 Its aim, he said, is to focus people's hearts and minds on Christ again. The fact that the first stop on his scheduled program for his trip to the Czech Republic is the Shrine of Our Lady of Victories in the Mala Strana district of Prague, where the image of the Holy Infant Jesus has been venerated ever since the 17th century, is "the most powerful expression of this intention," he added. During his visit Pope Benedict XVI will solemnly crown the image of the Holy Infant Jesus, which is revered by Catholic faithful from all over the world and to which numerous miracles and answers to prayers have been attributed. This is the highest honor that Western Christianity can accord such an image of Jesus Christ or the Blessed Virgin Mary, the 41-year-old Carmelite explained. 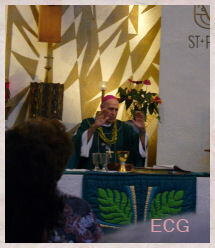 Father Sleich emphasized the longing that people have for a tangible and visible image of Christ. Images such as that of the Infant Jesus were a great help, he said, comparing them with family photos that help us to feel close to those we love. However, the difference between such family photos and religious pictures and images lies in the fact that the representation of Jesus Christ can lead to a "real encounter," he emphasized. The Infant Jesus of Prague is at once both King and Child, he explained, adding that the human heart is responsive to the image of the Christ Child. Even in the Czech Republic, which is regarded as the most atheistic country in Europe, Christmas is still held dear among people who in other respects show little sign of faith. "When people come here to our church and see God as a Child, they have no fear of him. On the contrary, he is a child who needs our love, our hearts, our hands, our help," Father Sleich stressed. At the same time, this Child is also portrayed as a King. 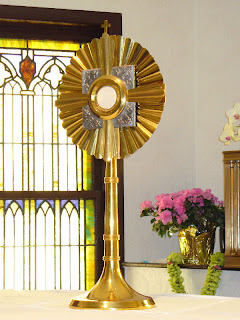 The orb held in his left hand symbolizes the entire universe, which stands beneath the symbol of the Cross and rests in the hand of the Child Jesus. Father Petr said, "I sometimes say, half jokingly, that the left hand of the Child Jesus is enough to sustain the entire universe. But of course it is no joke, but the truth. Meanwhile, with his right hand, the Divine Child blesses mankind." This is a symbol, the priest added, that is easily intelligible to people without a great deal of reflection, and "the most effective symbols are precisely those that do not require us to think long and hard about them." The fact that the Christ Child is represented as a King goes back directly to the Gospel. Matthew's Gospel begins with a genealogy, tracing Jesus back to the tribe of King David, and only shortly after his birth, men came from afar to pay homage to the newborn King, said Father Sleich. Near the end of his life, when Jesus enters the city of Jerusalem on a "little donkey," he is acclaimed as King by the multitude, and he is likewise crucified as a King, for the sign that Pilate has affixed to his cross has the letters “INRI” engraved on it, meaning "Jesus of Nazareth, King of the Jews." In these ways the motif of royal kingship stands both at the beginning and at the end of the Gospel, forming as it were, a frame, the Carmelite Prior explains. Something not many people know – the Infant Jesus of Prague was the inspiration for the book "The Little Prince"
Father Petr continued, saying, “The book is read in schools because it is not a religious book, and yet at the same time it is highly religious. It was directly inspired by the Infant Jesus of Prague. A child comes from Heaven, offers his friendship, dies and returns to Heaven again – Jesus would say, to the Father, but Saint-Exupéry was not quite sure enough of his faith. The children who visit the Infant Jesus appreciate that the Christ Child is not merely some kind of strange Catholic custom; rather they understand the true message!" Although, according to the statistics, barely a quarter of the Czech population describe themselves as "believers," the Prior of the Carmelite monastery in Prague is remaining optimistic. Jesus himself started with only a handful of disciples, he observed. One of these betrayed his Lord and hanged himself, yet with the remaining handful a great part of the world has been converted. Father Sleich himself was only baptized at the age of 20 after having found his way to faith through friends while a student of mathematics. Today almost his entire family is Catholic. His decision to become a priest was "not easy," he acknowledges, yet he was "very happy" once he had taken this decision. He conceded that there continue to be few vocations in the Czech Republic, but, he added, things can change very quickly, as we all saw 20 years ago with our own eyes, when the Iron Curtain fell." Father Petr regrets the fact that "we do not read the Gospels attentively enough." The priest also said that he is not sure it is even true that as many people in the Czech Republic are nonbelievers as is claimed. 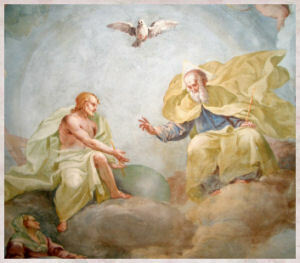 He pointed out, "Many people are uncertain when it comes to God, but I wouldn't say that they have no faith. And incidentally, even many Czechs who describe themselves as nonbelievers still love the Infant Jesus of Prague. I am certain that many of them will yet become his friends!" The turbulent history of the "Little King"
The image has suffered a turbulent history through the centuries. It is believed to have been a gift from St. Teresa of Avila to a Spanish noblewoman that found its way to Prague as a wedding gift for her daughter. Since 1628 it has been venerated in the Carmelite church. During the Thirty Years War it was desecrated by German Protestants from Saxony, who hacked off its hands and threw the image onto a pile of rubbish behind the altar. The Carmelite Fathers were also expelled from their monastery. 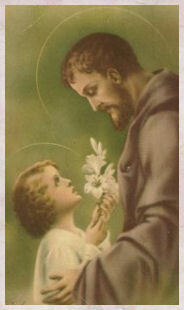 Some years later the image was rediscovered by Father Cyrillus a Matre Dei, a Carmelite priest from Luxembourg who had a particular veneration for the Infant Jesus of Prague. According to the legend, the Child Jesus pleaded with him to repair his hands, promising, "The more you honor me, the more I will bless you!" Subsequently the veneration for the Infant Jesus of Prague began to flourish anew and eventually spread around the world. There are now many shrines to the Infant Jesus of Prague in India, another is in the Italian town of Arenzano, near Genoa, and there are many others on almost every continent. Over the course of the centuries millions of the faithful all over the world have found consolation and help through this Little King. The Carmelite Fathers of Prague were later forced once more to leave their monastery around the beginning of the 19th century in the wake of the secularization by Kaiser Joseph II. It was not until 1993, after the collapse of communism in Central and Eastern Europe, that they were able to return once more to the Mala Strana in Prague. Today there are five Carmelite Fathers caring for the shrine. Two are Czechs, two are from India and one is Italian. The image of the Infant Jesus of Prague in the Church of Our Lady of Victories in Prague's Mala Strana is visited by up to a million pilgrims from all over the world every year. 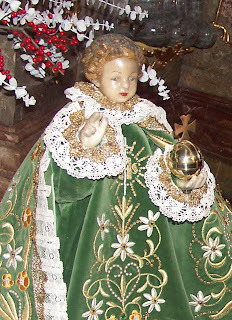 Many come from America or from the Philippines, where the veneration of the Infant Jesus is especially vibrant. Among those who had a great devotion to the Infant Jesus of Prague were St. Therese of Lisieux and St. Edith Stein. The famous French poet Paul Claudel devoted a well-known poem to the Infant Jesus. Just recently the Archbishop of Prague, Cardinal Miroslav Vlk, declared the pilgrim church of the Infant Jesus of Prague as the second most important shrine in the Czech Republic, after the St. Vitus Cathedral. In Him you found the "Old Friend"
When other friends were new. And named you His own "Child." To leave your friend in grief. Of all your friends, most true. Who leave Him not alone. And live for Him, apart. And love Him more and more. 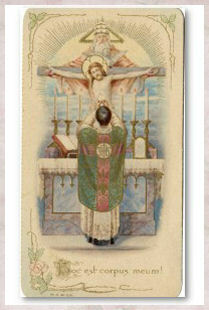 - from an old Holy card. Bishops throughout Pakistan have written to the country’s President demanding a public inquiry after a young man died in suspicious circumstances while in police custody following a love affair that went disastrously wrong. The official memorandum signed by the Bishops’ Conferences of both the Catholic Church and the Church of Pakistan comes amid allegations that 19-year-old Robert Fanish was murdered while being detained at a jail in Sialkot district, Punjab province. For the young man’s family, shock turned to anger on Tuesday, September 15th, when the body was released for burial covered in marks on his torso and arms, apparently showing that he had been severely beaten. Reports claim that the marks are inconsistent with police claims that Mr. Fanish hung himself. Autopsy results are due in a few days’ time. year-old Muslim woman ended in catastrophe. Determined to put an end to the liaison which breaks social and religious taboos, the woman’s mother is accused of fabricating a claim that Mr. Fanish had desecrated the Qur’an, a crime worthy of life imprisonment according to Article 295B of Pakistan’s Penal Code. It is alleged that she complained to Muslim leaders and in response a mob of extremists burnt down the church in Jethki, the village in Sialkot where she and Mr. Fanish lived. All the Christians in Jethki are said to have run for their lives. Reports received by Aid to the Church in Need (ACN), the Catholic charity for persecuted and other suffering Christians, say Mr. Fanish’s funeral yesterday developed into a protest about the circumstances of his death. Police used tear gas to disperse the crowds after tensions rose. In response, the President of the Catholic Bishops’ Conference Archbishop Lawrence Saldanha of Lahore, joined forces with his Protestant counterparts from the Church of Pakistan in drawing up an official memorandum requesting a ‘fair inquiry’ into Mr. Fanish’s death. The document has been sent to Pakistan President Asif Zardari, Prime Minister Syed Gilani and Shahbaz Sharif, Chief Minister of the Punjab Province and brother of former Prime Minister Nawar Sharif. Stressing that it was the fourth incident of its kind within three months – each incident involving violence against the Church prompted by a Blasphemy Law allegation – Fr. Nisari said Christians in Pakistan felt under ever-increasing strain. Fr. Nisari said that the demonstrations at Mr. Fanish’s funeral coincided with a demonstration of 600 people in front of the Press Club in Lahore. He added that the Catholic-run National Justice and Peace Commission, based in Lahore, has also called on the government to instigate a public inquiry into the death. The NJPC is spearheading a national petition calling for the repeal of Pakistan’s controversial Blasphemy Laws, which are widely seen as subject to violent abuse and prejudicial against minorities. ACN has joined the call for action to abolish the Blasphemy Laws. Aid to the Church in Need also spoke out last month after nine people were killed in the Punjab city of Gojra, again in a wave of violence linked to the Blasphemy Law. Want to find out what’s coming up on EWTN? Go to the “Television” tab at the top of our home page (www.ewtn.com), and click on “television home” in the drop down menu. Then, simply click on “program schedules” at the top of the page, and “downloadable schedules” for the month (under North America ) It’s easy! Today is the optional memorial for St. Robert Bellarmine, brilliant Jesuit preacher theologian. "To please God by penance it is not enough to say in words, 'I am sorry for my sin.' Rather, we need the deep and profound sorrow from the heart that can hardly be found without sobs and tears and sighs. It is amazing how severely the holy Fathers speak of true contrition. 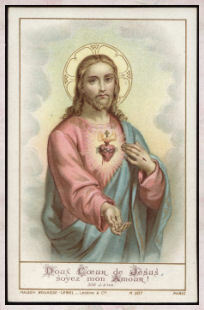 A heart truly contrite and humble really arouses the mercy of God our Father in a marvelous way. For the sweetness and goodness of the Father cannot refrain from going froth to the prodigal but truly repentant son, and embracing and kissing him. He will give him the ring of peace, wipe away the tears of sorrow, and fill him with tears of joy sweeter than all honey (Lk 15:11-31)"
The other day I had a discussion with one of my brothers about exactly this topic...how people treat their pets as if they were their children. My brother, owner of a chinchilla, cat and turtle, ended up telling me I could not tell people how to feel about their pets...except on my blog. Well, I was going to ditch the idea and had it not been for the above article, I would not have given it another thought. But I feel I must address the pet-child mindset. It appears that more and more people are losing the distinction between a pet and a child. - People are no longer referred to as a pet's owner. No, they are now "Mommy" or "Daddy"...pet parents. The name they choose for their precious pets are no long "Fluffy" "Lucky" "Snowball" or "Coco" Emily, Betsey, Rooney, Gracie, etc. have replaced the traditional pet name. These are human names! On the other hand babies are given what appear to be pet names e.g. Gwynth Paltrow's daughter Apple, Courtney Cox's daughter Coco... It doesn't seem that long ago that dogs were named "Fido" a name that really captured the dog's spirit...that of fidelity to its owner. - It is not an unusual sight in my neighborhood to see an owner pushing the precious pooch in a baby stroller. - One no longer boards a pet in a kennel. Now you have doggy daycare for the pup. Those of you who are regular readers of this blog or who know me personally know I love animals. I have loved animals, had many pets and have rescued many animals ever since I was a little girl. I even have a pet prayer blog to pray for God's creatures, the beloved pet. I am sharing these observations with you from an animal lover's point of view. The danger of humanizing a pet's relationship in the family is that it diminishes the value of the human person. Isn't that what the pro-life movement is fighting for...value for human life? It is a very sad thing when all efforts are made to rescue a baby bird that has fallen out of its nest. We lose sight that sometimes a mother bird will push the sickly baby out of a nest because it will die anyway. God has a way of keeping nature in balance if we stop interfering. Yet when a defenseless human baby is in danger of being killed at the hands of an abortionist, only a few try to save the baby. Aren't these human babies even more precious, lots more cuter and loving than a baby animal? I cringe and will continue to cringe every time a well-meaning person, usually a friend, refers to me as my dog's "Mommy". I am "Mommy" to one child and his name is not "Coco". A teenage love affair in Pakistan had devastating consequences when fanatics set fire to a village church and forced all the Christians to flee. Hundreds of Christians narrowly escaped with their lives on Friday, September 11th, when extremists went on a rampage in Jethki village in the Sialkot district of Punjab Province. Armed with bricks, stones and sticks, they sprinkled kerosene on the church before setting it ablaze and desecrating it. The mob also carried out an arson attack on two Christian homes next to the church and threatened to kill the inhabitants of the village. Church leaders claim the violence was sparked by a Muslim woman who was furious that her 18-year-old daughter had broken a social and religious taboo by becoming romantically linked to a Christian man. Determined to break off the three-year-old relationship between the two school classmates, clergy allege that she ripped a page containing verses of the Qu’ran out of a book and was seen throwing it in front of the man’s house. She is then said to have run to the local Muslim authorities and accused the man of desecrating the Qu’ran, thereby breaking Pakistan’s infamous Blasphemy Laws. Desecration of the Muslim holy book carries a maximum sentence of life imprisonment under Article 295B of the Penal Code. The Muslim authorities apparently orchestrated the violence as an act of revenge. The violence is the fourth of its kind within three months and has prompted yet more calls from Christian leaders in Pakistan – and others alike – for the Blasphemy Laws to be repealed. On Saturday, September 12th, the day after the Sialkot incident, Pakistan President Asif Ali Zardari condemned the attacks and pledged government funds to repair the church. Meanwhile, the 19-year-old man at the center of the crisis is being detained in prison while police investigate the incident. He is not being named for security reasons. “We are actually glad that the 19-year-old boy is in jail at the moment – at least there he will be safe. It means he won’t be killed by the fanatic Muslims,” the priest said. He repeated calls for the Blasphemy Laws to be overturned. “The laws hand people – Muslims in particular – an invisible sword enabling them to take revenge on anybody they like. This case shows that religion is being misused in our country and that it is very necessary that the Blasphemy Laws be repealed. Aid to the Church in Need is calling for the repeal of the Blasphemy Laws. The incident on September 11th is not being linked to the eighth anniversary of the attacks of the attacks on the Twin Towers in New York. Pakistan minorities’ minister, Shahbaz Bhatti, the only Christian in Pakistan’s federal cabinet, will visit the region and submit a report to the government. Church leaders are interpreting the incident as yet further evidence of widespread persecution against Christians across the country. The continued unrest climaxed last month with attacks in Punjab Province’s Gojra city, where nine Christians were killed. 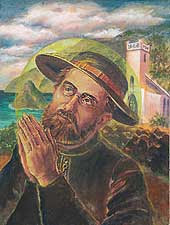 This beautiful painting of Blessed Father Damien praying, was painted by an artist on Molokai. Her name is Linda Johnston. She graciously forwarded a sampling to me this morning with permission to share it on this blog. Please be sure to visit her website here. There are many lovely prints, cards, etc. for sale. For those of you on Hawaii, remember to support our local artists. 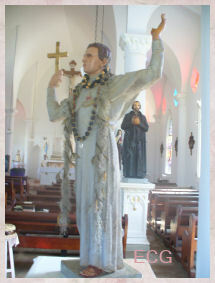 I am adding the link to the sidebar under the Father Damien resource links. 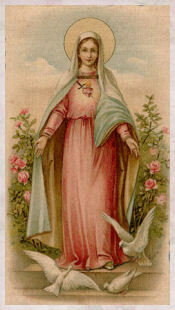 "All the sorrows of Mary...are merged in the supreme suffering at the Passion. In the Passion, Mary suffered a martyrdom of the heart because of Our Lord's torments and the greatness of her love for Him. 'She it was,' says Pope Pius XII, 'who immune from all sin, personal or inherited, and ever more closely united with her Son, offered Him on Golgotha to the Eternal Father together with the holocaust of her maternal rights and motherly love. As a new Eve, she made this offering for all the children of Adam contaminated through his unhappy fall. 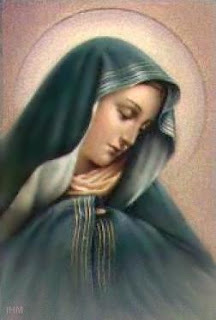 Thus she, who was the mother of our Head according to the flesh, became by a new title of sorrow and glory the spiritual mother of all His members." 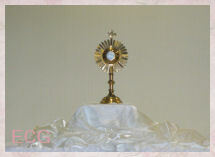 - The Prayer Book, Catholic Press, Inc.
directed towards this one most desirable object. and immaculate Mother of God. 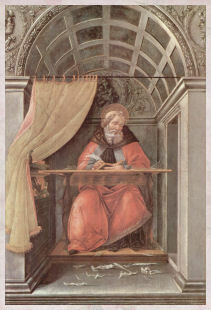 Note: The faithful who, during the month of September, pray or perform other devotions in honor of the Blessed Virgin Mary Sorrowing, may gain: an indulgence of 5 years once, on any day of the month; a plenary indulgence on the usual conditions, if they persevere daily in this devout practice throughout the entire month. The most senior Catholic leader in the Middle East has said that the future of the Church in the Holy Land is now in doubt – unless fellow Christians around the world step up efforts to help them. Speaking to Catholic charity Aid to the Church in Need (ACN), Patriarch Fouad Twal stressed that emigration had drastically reduced the numbers of Christians in both Israel and Palestine. The Patriarch said that the faithful in Jerusalem were expected to fall from 10,000 today to little more than 5,000 in 2016. He also said that in the Holy Land as a whole, Christians had declined from 10 percent to two percent within 60 years – although other evidence shows the decline to be even more severe. The patriarch stressed the importance of five ‘P’s – prayer, pilgrimage, pressure (lobbying and other political activism), projects – all leading towards peace. Already in the time of the apostles the cross on which Christ died had become the symbol of his redemptive death, and a symbol for himself and for Christianity. In 335 A.D. on September 13 the Church of the Martyrdom and Resurrection was dedicated in Jerusalem. The next day, in a solemn ceremony, the faithful were shown the cross that the Empress Helen had discovered on September 14, 320. This ceremony was repeated each successive year on September 14 in that church, which possessed a large relic of the cross. The reverent elevation of the relic of the true cross gave this day its name, “exaltation of the cross.” From this gesture we have our popular contemporary hymn, “Lift high the cross.” Later this feast was combined with the memorial of the rescue of the stolen cross from the Persians by the Emperor Heraclius in 628. The striking prayers of the Divine Liturgy for this day testify to the grace of our salvation as expressed in Christ’s promise, “When I am lifted up from the earth, I will draw all to myself” John 12:32). 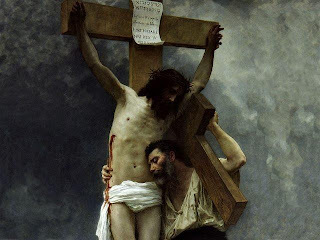 The tone of the feast of the “Exaltation of the Cross,” which more properly is now called the “Triumph of the Cross,” is quite different from the somber and sorrowful liturgy of Good Friday. September 14 has a definitely joyous character. It recalls our happiness about our salvation. Because the cross has become so commonplace, there is danger that this symbol of Christian salvation may lose much of its significance. The cross is visible in so many places and we see it so often: in church, in our room, in public displays, even on some hilltops. Frequently we make the “sign of the cross” over ourselves when we pray and at other times. Even in the secular realm the word “cross” is widely used not only as a symbol of honor or service as in “Red Cross” and “Distinguished Service Cross,” but even in more prosaic terms such as “criss-cross,” “crossword,” and other common expressions. How do we overcome the tendency to lose or dilute the importance of the word and the symbol? We need to devise solutions and reminders to overcome that kind of passivity. One approach is to think of and to speak of the striking symbolism of the two beams that make up the cross. The upright (vertical) beam with its orientation pointing both above and below will remind us that the Son of God came down from heaven for us and for our salvation. This beam is a symbol of God’s love for humankind, which manifests itself especially in the Incarnation and in Christ’s sacrificial death on the cross. The upright beam will also remind us of the necessity of lifting up the human spirit to God. When people forget this upward climb to God, this transcendence, they quickly lose awareness of the fundamental dimension of their own creaturely status and dependence on the Creator. Then the illusion of human autonomy quickly encroaches resulting in error and confusion. The horizontal (cross) beam points both left and right indicating our fellow human beings all round us. That reminds us that together with the love of God, the love of neighbor is essential to the Christian commandment of love. True holiness cannot overlook one’s neighbor. Christ himself demonstrated symbolically with his arms extended on the cross what he had earlier proclaimed publicly: “When I am lifted up from the earth, I will draw all to myself” (John 12:32). Let us stretch our arms wide as Jesus has done, so that we will embrace the whole world. We cannot love God while denying our fellow human beings practical love in concrete situations. Christ refers every good deed, and every good deed left undone, to himself: “...you did it (did not do it) to me” (Matthew 25:40-45). 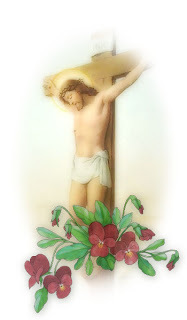 Recalling the vertical and horizontal beams of the cross in this way is a lively reminder of the Christian way of life. To give the symbol of the cross such a prominence in our lives is the most significant “exaltation” and “triumph” of the cross. May the feast and each time we bless ourselves remind us of this. O Holy and Sacred Wood! God's work of salvation stands human expectations on their head: humility is exaltation, wounds are healing and death is life. May I never boast except in the cross of our Lord Jesus Christ, through which the world has been crucified to me, and I to the world (Gal.6:14). May I never desire any other treasure than his poverty, any other joys than his sufferings and any other love than He Himself. Thank you Fr. Vince Inghilterra! by your cross exalt our monasteries. that we may be protected beneath the wings of your cross. New Saint Joseph People's Prayer Book, Catholic Book Publishing Co.
"Modesty is the prudence of chastity". ...Be modest in your dress, in your words, in your behavior if you want to help men acquire and preserve the virtue of purity. Ladies, you can be an angel or a devil to a man. He needs your help to stay in God's grace. It is very difficult for him to do this on his own power. Some day you will be held accountable for what is expected of you. If you want the Lord's blessing, learn to be modest. Copyrighted by Fr. 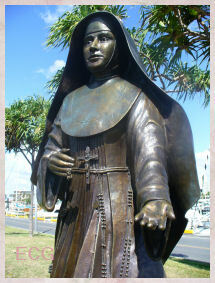 Angelus M. Shaughnessy, OFM Cap.